This shot came to us from Mark Foo's sister, Sharlyn along with one of Mark's big wave guns (which will be featured as the next Gem of the Week). 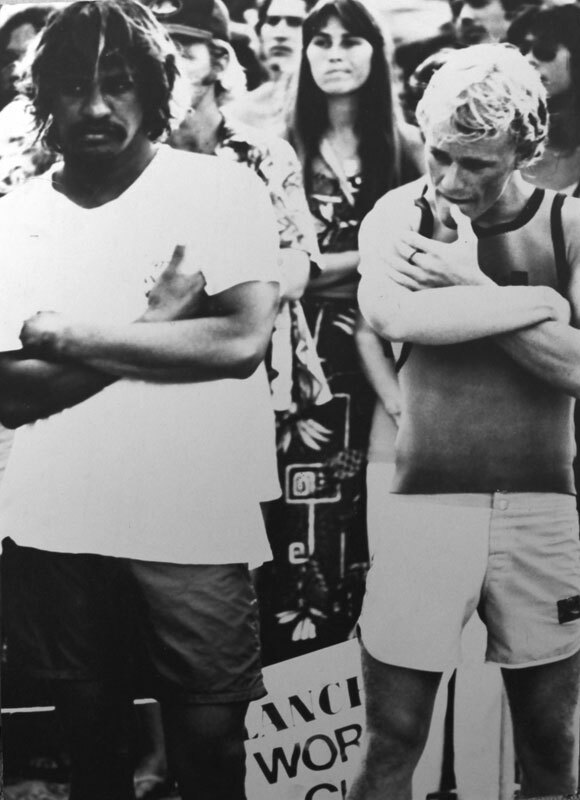 This image of Eddie Aikau and Peter "PT" Townend was taken during one of the mid-seventies World Cup contests. Held at Haleiwa on the North Shore of Oahu, probably around the time the Australians were making their presence known by "Bustin' Down the Door". This raised a few hackles among the native Hawaiians, and Eddie played the diplomat to help soothe things down. Tragically just a couple years later, he would be lost at sea while attempting to paddle for help for the sinking ship the Hōkūle'a he was crewing on.